SqualVax is a squalene oil-in-water emulsion similar to MF59. SqualVax is available in three quantities: 10 mL, 5x10 mL & 10x10 mL. Shipping and storage: SqualVax is shipped at room temperature and stored at +4°C. SqualVax is stable for 6 months. DO NOT FREEZE. SqualVax is an oil-in-water emulsion made of squalene droplets in a continuous aqueous phase. It is fully biodegradable, which is an important advantage over alternative oils that have been used in emulsion adjuvants, like Freund’s adjuvant that contains mineral oil (paraffin oil) and has long term persistence in the organisms. Squalene emulsion induces local stimulation and recruitment of DCs and granulocytes, differentiation of monocytes into DCs and increased uptake of antigen by DCs. The emulsion acts more specifically on macrophages present at the site of injection. A local increase of chemokines released also influences the recruitment of immune cells from the blood to the site of vaccination, creating an amplification loop. This formulation enhances differentiation of monocytes towards a mature phenotype, thereby promoting migration of antigen-loaded cells to the draining lymph node. Compared to aluminium salts, a stronger immune response is elicited (e.g higher antibody “humoral response, Th2” and T-cell response “cellular response Th1”) with a mixed and more balanced Th1/Th2 cell phenotype. The inoculum should be free of extraneous microbial contamination; filtration of the antigen before mixing with the adjuvant is recommended. Allow SqualVax reagent to reach room temperature before beginning. 5. 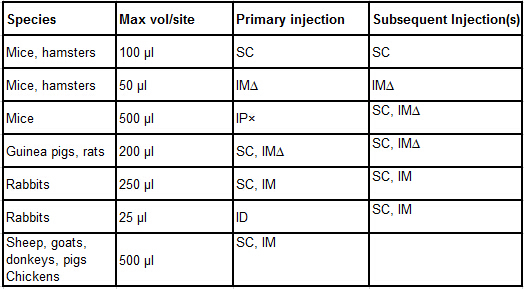 Inject into the animal according to the table below; the volume depends on the site of injection. Typical routes of administration include subcutaneous (SC), intramuscular (IM), intradermal (ID) or intraperitoneal (IP).